She had the makings of an icon early on. She made me and a million other girls want to be a surfer chick after watching her in Blue Crush. I'm pretty sure she was the envy of many when she hooked up with Orlando Bloom. Now she's not just a fashionista but a fashion muse. Not to mention, an in-demand actress with a line-up of new movies set to come out one after the other. The girl who gave up a Princeton education to pursue acting full time is going places that's for sure. But in fashion, it looks like she's here to stay. why did she have to join the skinny wagon? she already looked so good before! Oh, come on. She made the cover of Vogue because she's paying her publicist $20,000 a month for the privilege, and has a film coming out in the next few weeks. Oooh juicy! Does that mean if I pay a publicist $20,000 I get a Vogue cover too?! I'd also be excited to see Camilla Belle earn a cover but honestly, American Vogue covers are so banal and redundant so I'm often less enthusiastic about the next cover. Hey CD! have u tried reading Grazia?? Well, that's true Gian. 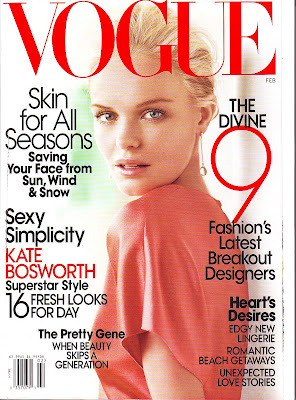 I actually get bored reading Vogue, but for some reason, I need my monthly fix, hehehe. Grazia? Not yet! But since it's a weekly, all the stuff there must be fresh, hot and fast! I need to find out where I can get my hands on one though! Hi, can you tell me, if you have this mag in hand, if this is he issue featuring Sarah Palin?